I took a break from my To-Do list last weekend to make a new pincushion (or 2). These would make cute little gifts, so I included a quick template and tutorial if you’d like to make your own. 2. Use a 1/4″ seam allowance. Pin and sew the wedges into 2 halves, pressing the seams open, or towards the colored fabrics. Be careful not to stretch all those bias edges! 3. Sew the halves together. 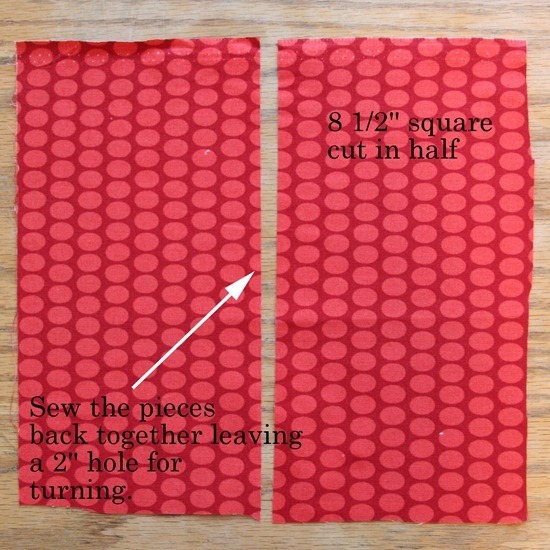 You’ll notice even my wedges stretched slightly during sewing and didn’t line up after sewing…just trim off the excess slightly with scissors to make a nice round circle again. Press the seam open to reduce bulk. 4. For the back you’ll need a 8 1/2″ square of fabric. Cut the fabric in half down the middle. 5. Now sew the two halves back together…but this time leave a 2″ hole in the center for turning. Make sure to backstitch really well on either side of the opening so it won’t come apart during stuffing. 6. Center the top of the pincushion right side down on the backing with the turning hole in the center. 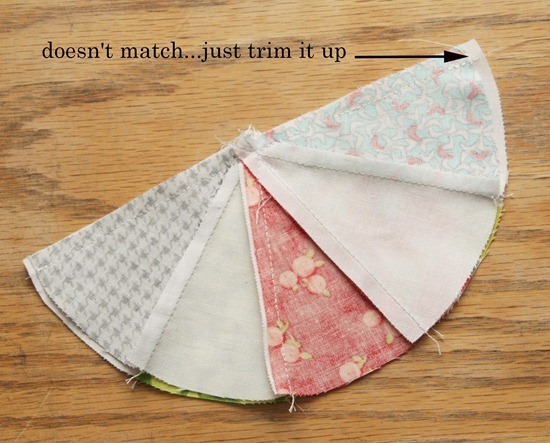 Pin and sew all the way around the edges…no need to leave another hole. 7. 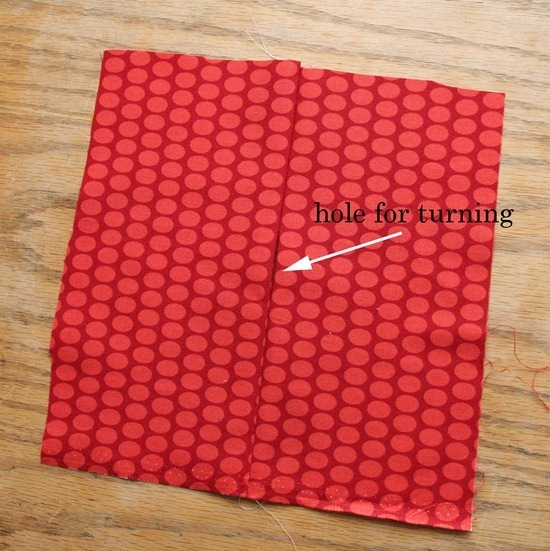 Trim around the circle with scissors and turn right side out through the hole in the back. Press. 8. Stuff it good and tight through the hole in the back…then ladder stitch the hole closed. 9. Add a button just like I did on the Sprocket Pillows (scroll to the bottom) and you’re done! Moosh it around good to get the stuffing around the edges and stick some pins in it. Lovely! I've never made a pincushion before, but this is definitely on my list. You make it so easy! Thanks! So so cute! Love it! So cute…how big are your wedges? this is so lovely! I've been wanting to make a pin cushion or twenty and am collecting patterns! Thank you!! How cute! That is going on my to-do list! So cute!! I made a sprocket pillow for my daughter's bed. Now I can have a little sprocket for my sewing room. Thank you! I could use a few more pin cushions. I love this! Super cute and colorful! Thanks so much for sharing this lovely! Have a wonderful day! Too cute! What a quick gift idea too! Thank you! super cute! thanks for the how-to! My sprocket pillow is an all time favourite….and now a pincushion!! I'm drooling!! Thanks! darling! What do you fill your pincushions with?? I love that you post patterns and tutorials. Great job. More, More!!! What a cute idea! Would love to make a few as little gifts for the holidays. Sewers and quilters will love this! Cutesy thing ever!! 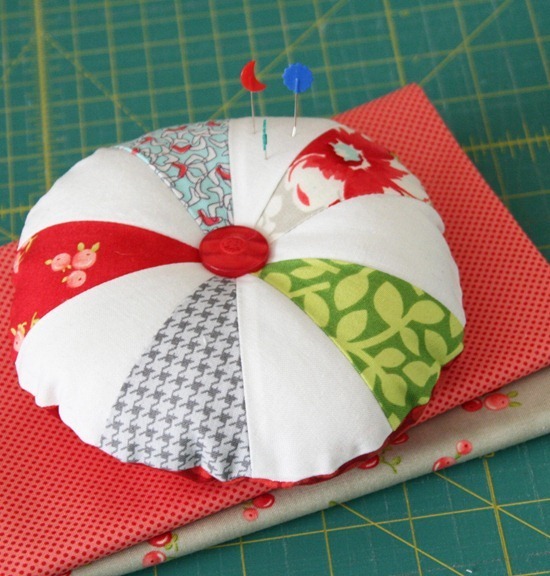 Your sprocket pillow is definitely one of my top 5 tutorials so I can not help but love this pincushion too! Thanks for the directions. Have a great day!! Great cute pin cushion! I love that you used the term "ladder stitch". Years ago I made some items that required great amounts of the ladder stitch. I got good at it! and it's never left my brain! :) A good stitch. I use it a lot! Thanks. Oh, come on. That is ridiculously cute! I might have to make this for my modern quilt guild gift exchange instead of the felt cupcake pincushion I was planning. Decisions! Decisions! Love all the little bits of fun fabrics you incorporated into this! Thanks for sharing the joy! So cute! I am only bummed that none of my friends sew so they wouldn't be nearly as excited as I would receiving this. :) great tutorial for a quick last minute gift. Love it! Thanks for sharing! I'm gonna try this. Great stocking stuffer idea! Thanks! I need to add this to my long list of things to get done before Christmas–mine will be in aqua blue, red and white! What a great tutorial! I just made a pincushion and it was easy. Thanks for the great tutorial. OMGOSH ALLISON!!!! THAT'S THE CUTEST THING EVER!!!! I LOVE IT!!!!! Perfect! hank you so much for sharing your pattern. Your sprocket pillows were the first thing I added to my 2012 list. Can you believe I don't have a pincushion? Guess I've been waiting for the perfect one and here it is! May I ask what you used to stuff it? Love this, especially the back opening for stuffing-had a big duh moment there. I am in the process of doing bird pincushions but these go on the list! Cute, cute, CUTE! 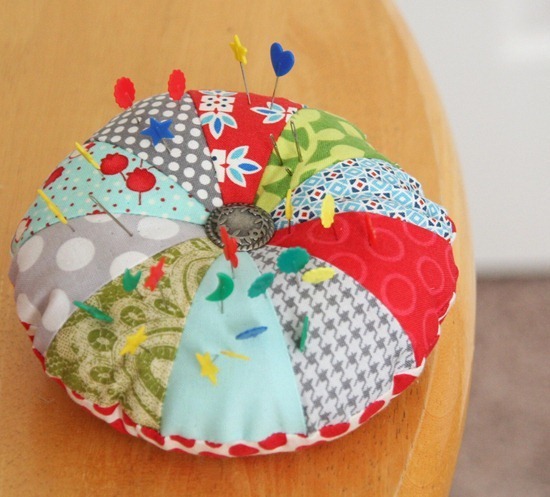 Thanks for sharing – love this little pretty pincushion! Very cute! I will be making some of these for gifts. Thanks for the pattern and tutorial. it's so so cute!! thank very much!!! This is so cute! Thank you for the tutorial. 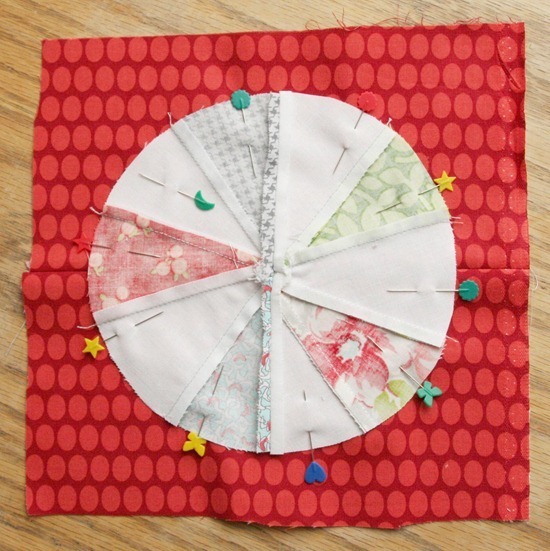 So cute….I enjoyed making the sprocket pillow, now a mini version! I've yet to make a pin cushion. You made this look easy and doable. On to my 'to-do soon' list. Thanks for sharing. Love it! Thanks for the tute! Thank you for all your wonderful visual tutorials!! I ordered the pattern for the Christmas stocking last year and I'm just now getting time to make one. Without your instructions with pictures I was lost….thanks so much!!! Thank you SO much for sharing this wonderfully quick idea – took me about 10 mins. to make and it is adorable! Cute cushion! Am I the only one that forgets to leave open a hole to turn? I do it all the time. Perfect! I just made a pincushion like this that is less than perfect. It's on my blog. And I think you're a genius for figuring out how to get the hole in the middle. So I put a link to your post on my blog. I love all of your tutorials! Just finished the sprocket pillow, and really want the pin cushion to be my next project, but I can't seem to open the template on this one. Any suggestions? LOVE IT! Cute pincushion. I have a thing for pin cushions. What did you fill it with and did you pull the button down someway so that it dips into he pincushion? Thank you so much!! I love this tutorial! Very easy with the pics and bullet point type of instructions. Also love the colors you use – bright and happy!! Love it and is very cute. I am going to make it as well. Did you fill it with fiberfill or a stainless steel pad. I have read the later sharpens pins. Thank you for having the tutorial show up. I was just on another one and it gave me the run around and no directions.